Charles Gaa is Director in the Financial Stability Department of the Financial Institutions Division. 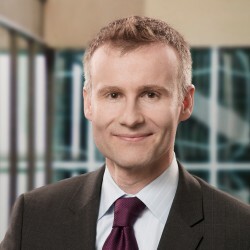 He first joined the Bank of Canada in 1999 as an Analyst in the Financial Markets Department, where he worked for four years before leaving to continue his studies. Prior to re-joining the Bank of Canada in 2013, he was an Assistant Professor of Finance at the University of Oregon. Charles is a Chartered Financial Analyst (CFA) and holds a PhD in Finance from the University of British Columbia. The authors contrast the impact of two sources of information flow on the volatility of prices, trading activity, and liquidity in the brokered interdealer market for Government of Canada bonds. The authors empirically measure Canadian bond market liquidity using a number of indicators proposed in the literature and detail, for the first time, price and trade dynamics in the Government of Canada secondary bond market. They find, consistent with Inoue (1999), that the Canadian brokered interdealer fixed-income market is relatively liquid for its size. Innovations in communications and information technology and the related globalization of financial markets have created the potential for important changes to the structure of Canadian equity markets. Established marketplaces can now compete more effectively on an inter-regional and international basis. At the same time, reduced costs have lowered the barriers to entry faced by new competitors known as alternative trading systems (ATSs). In response to this heightened competition, established Canadian stock exchanges have taken measures to improve market quality. While regulators see innovation as positive for the development of Canadian markets, there is some concern that market liquidity may be fragmented in the short run. The Canadian Securities Administrators have proposed a framework that attempts to address this issue and that would allow ATSs to compete with traditional exchanges for the first time. The authors provide an overview of the Canadian equity market and its structure, focusing on these recent developments. This paper investigates the effects of the continuation of globalization and technological developments on the future of national-level financial markets and trading centres, particularly in smaller countries such as Canada. We foresee the development of a single global market in the most-liquid assets based on equity-market linkages.